The challenges facing African communities are complex and not easily solved. Because of this reality, Reach the Children is implementing ways to address these challenges in a holistic manner. One such method is carried out through Community Development Centres. 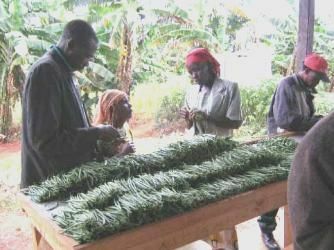 In 2003, Reach the Children partnered with Kenya’s Mutituni Horticultural Growers, leading to the opening of two more Community Development Centres in Lita and Nuguni, both also in Kenya. Reach the Children has been able to help the farmers increase their crop yields through training in drip irrigation by a farming expert. Increased crop yields combined with marketing training and exportation connections have resulted in an increase in families’ income by ten times. Produce is shipped out to Dubai and the U.K.. Over 2,000 AIDs orphans were placed in households of the farmers areas around Mutituni, Lita, and Nuguni. In addition to the produce assistance, these communities have benefited from Reach the Children’s family-based Orphan Care program. The capability of the local people to care for their orphaned children has increased, bringing greater hope to the orphans. Reach the Children has also supplied many orphans with blankets, clothes, shoes, pencils, books, kerosene lamps (for studying in the evenings), and scholarships to secondary school. AIDS Prevention is also taught in some of the local schools. In this way, all of Reach the Children’s areas of focus are implemented to help the community become a better one. Given the opportunity and the resources, African community members can discuss, evaluate, and solve their own problems using a holistic approach, often involving all five focus areas. With facilitation, tools, and techniques from Reach the Children, the communities’ solutions are effective and sustainable. Reach the Children encourages this approach and lends support when needed.